G.V.K. E.M.R.I. 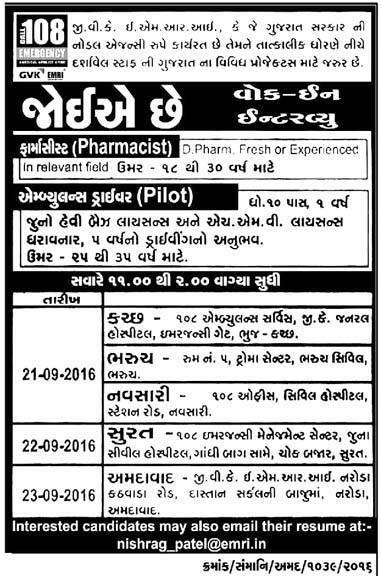 (Emergency Management & Research Institute) Published Recruitment Advertisement for Pharmacist & Ambulance Driver (Pilot) Posts. 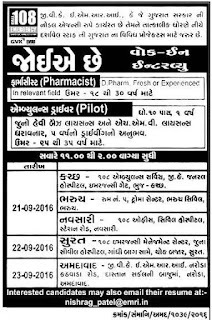 Kutchchh : 108 Ambulance Service, G. K. General Hospital, Emergency Gate, Bhuj - Kutchchh. Bharuch : Room No. 5, Troma Centre, Bharuch Civil, Bharuch. Navsari : 108 Office, Civil Hospital, Station Road, Navsari. Surat : 108 Emergency Management Centre, Old Civil Hospital, Opp. Gandhi Baug, Chock Bazar, Surat. Ahmedabad : G.V.K. E. M. R. S. Naroda Kathwada Road, Near Dastan Circle, Naroda, Ahmedabad.